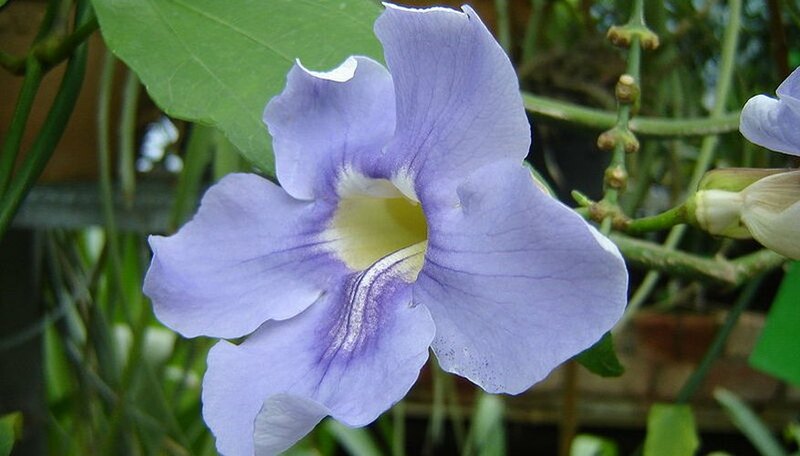 Thunbergia is a family of tender perennial flowering shrubs and climbing vines. They thrive in sun and evenly moist soil; and, depending on the varietal and growing climate, bloom from early summer through late fall. Coloration of their bloom varies widely from the golden-hued black-eyed susan thunbergia, to the blue thunbergia grandiflora. Hues of white, orange, lavender and violet are also commonly found. Situate thunbergia so that it is in full sun exposure. Some afternoon shade will be tolerated without severely impacting bloom. Provide a nutrient-rich soil that is kept evenly moist throughout the growing season. Allowing the soil to dry out will cause near immediate wilt. When growing in containers or hanging baskets you may need to water as often every other day during the peak heat of summer to maintain the soil moisture. Feed your thunbergia with a water-soluble general purpose fertilizer once a month. Always apply the diluted fertilizer solution over wet soil and follow the manufacturer's dosing instructions, erring on the side of less fertilizer rather than more. To prevent excessive moisture loss to evaporation, mulch around the base of the plant with an organic material such as shredded bark or cocoa hulls. Provide a sturdy structural support for your thunbergia--be it a fence, arbor, trellis or pergola. Gently twine or secure the vines and tendrils around the supports and the plant will continue to climb. When not given a structure to latch onto the plant will grow in a vining shrub habit that can get to looking unkempt if not tidied up occasionally with pruning. Deadhead or pluck spent blooms as they fade to encourage new bloom formation. In climates where thunbergia grows as a perennial you can prune it back for shape and size as desired in the fall or early spring. In cooler climates where it grows as an annual you can lift the plant and roots from the soil, pot it up for winter in a greenhouse or simply discard the plant.